Owner, Carl Dixon. 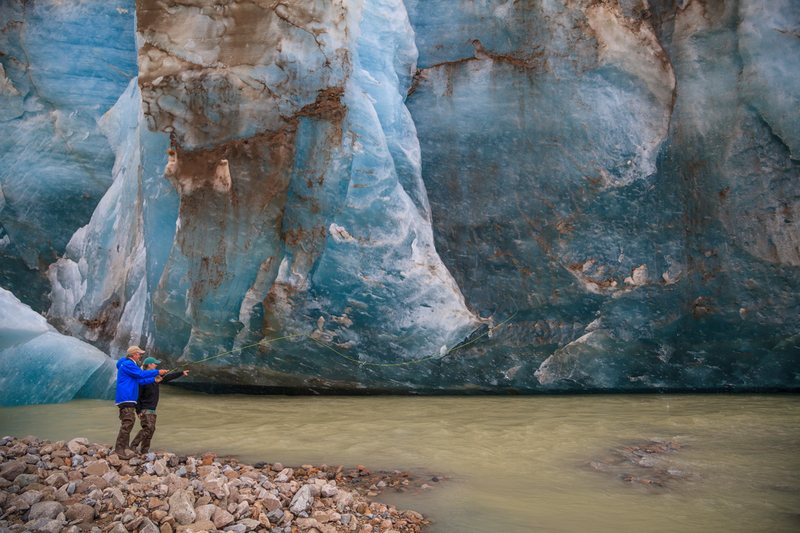 Carl Dixon’s love of the Alaskan backcountry and desire to guide our guests to new outdoor experiences has been the inspiration for our adventure program and guide model. Carl enjoys sharing with experienced adventure travelers as well as novices the rarely visited and exciting, sometimes newly discovered, hidden spots of the Alaska Range that we travel within. Whether it is heli-hiking or sport fishing in the summer or dog mushing and backcountry skiing along the Iditarod Trail during the winter, Carl has spent the better part of the past forty years still discovering and exploring within the wild! Kirsten and Carl Dixon purchased Winterlake in the early 1990s. At the time, the lodge was operated as a hunting camp. Despite financial loss, the Dixons made the commitment to sustainable adventure and ceased all hunting. Over the next two decades, regional wildlife such as bears, moose, beavers, wolverine, loons, swans, and river otters have returned in remarkable numbers. Winterlake Lodge serves as the Finger Lake checkpoint for the Iditarod sled dog race and is situated at Mile 198 along the Iditarod National Historic Trail. The lodge is home to approximately twenty sled dogs. 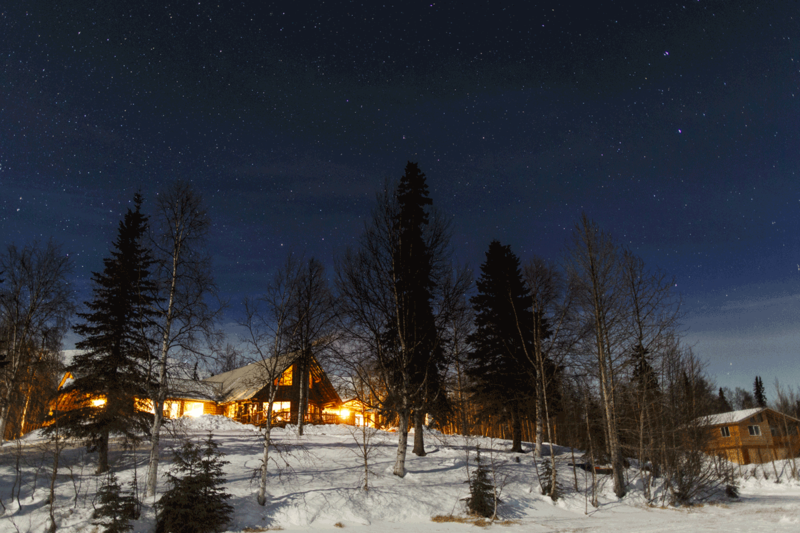 In the winter, the lodge offers a dog mushing school as well as a helicopter-skiing adventure program. 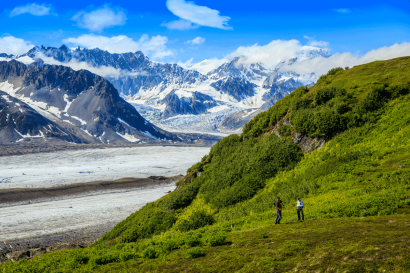 In the summer, guests explore the untouched wild western edge of the Alaska Range, including the famed Tordrillo Mountains. Kirsten Dixon is an award-winning chef and author. The Winterlake Lodge kitchen offers Alaskan cuisine and cooking classes to visitors. Carl Dixon, the owner, continuously makes improvements by hand. 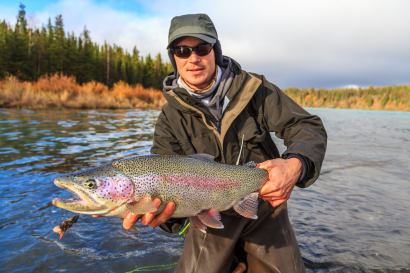 Winterlake Lodge rests between the magnificent Tordrillo Mountain Range and the towering peaks of the Alaska Range on a peaceful lake. 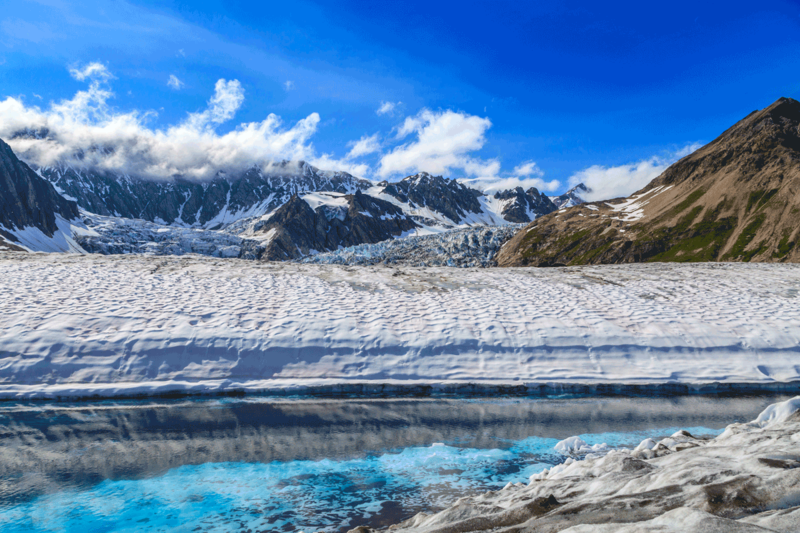 We offer summer and winter trips that bask in the interior experience. 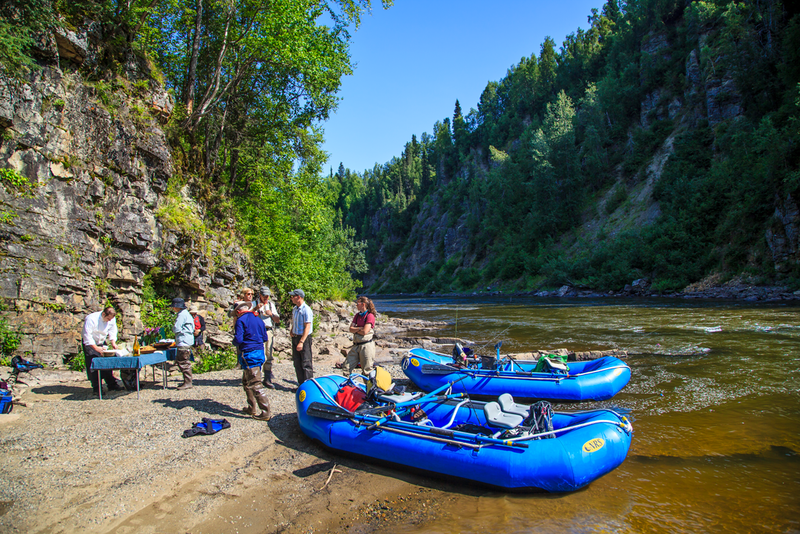 In the summertime, join our guides and chefs, for a truly unique and rustic adventure. Soak up the long summer days via helicopter exploring glacial pools, rafting and fly fishing wild rivers, scrambling a rugged ridgeline, or revering in the wildflowers and subtle sounds of your surroundings. 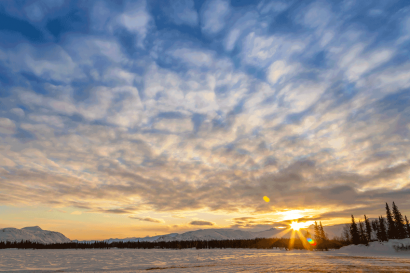 In the winter, experience the northern lights after a day of dog-mushing, heli-skiing, snowshoeing, or cross-country skiing with Carl Dixon. 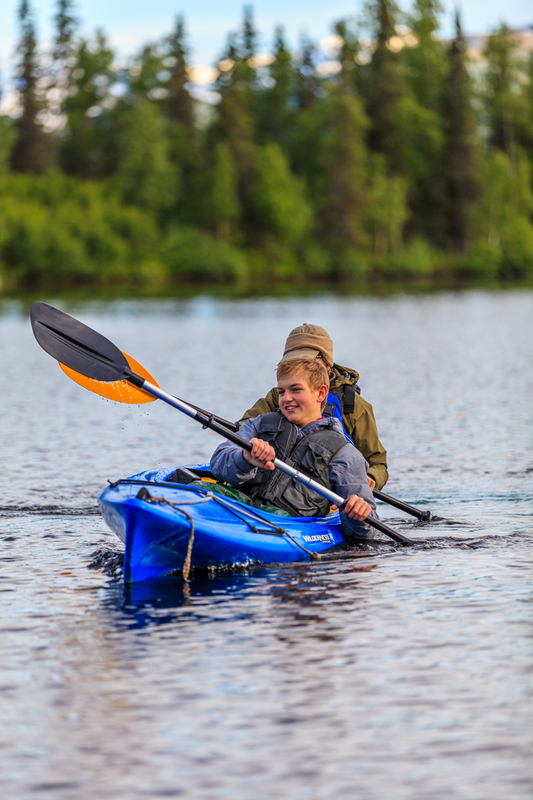 Back at the lodge, enjoy a massage, cooking class or kayaking the lake. Summer or winter will be flavoured by geography inspired hearty fare from our award-winning chef Kirsten Dixon. Winterlake Lodge is located on the western edge of the Alaska Range, just south of Denali National Park and Preserve. 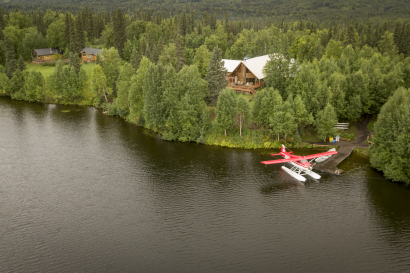 Our secluded lodge is only reachable by float plane, about an hour flight from Anchorage, Alaska. 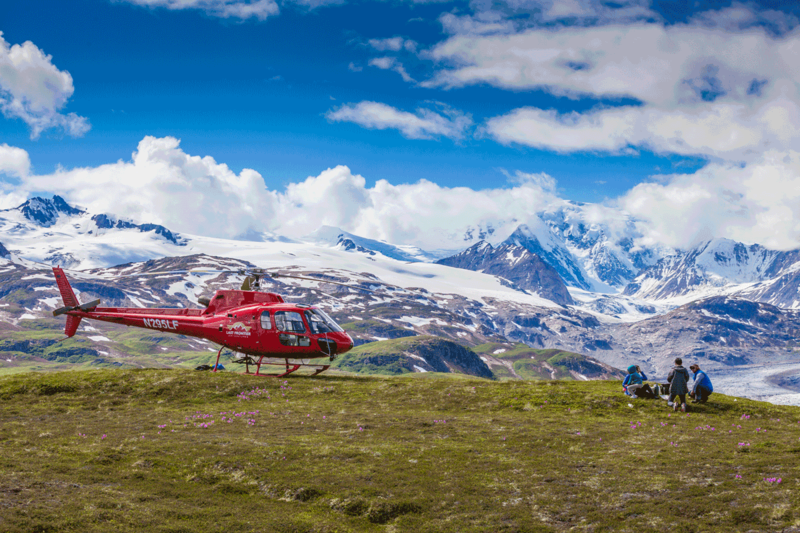 Flight-see along the southern edge of Denali, Hiking, Glacier Trekking, Sports fishing, River rafting, Dog mushing (winter), Heli-skiing (winter), Snowmobiling (winter), Cooking classes. 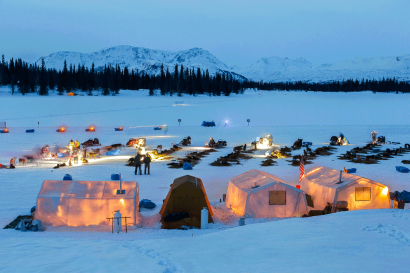 Winterlake Lodge serves as the Finger Lake checkpoint for the Iditarod sled dog race and is situated at Mile 198 along the Iditarod National Historic Trail. We encourage children of all ages to experience the natural world. Special rates apply for 12 and younger. Six guests cabins that surround the main lodge. 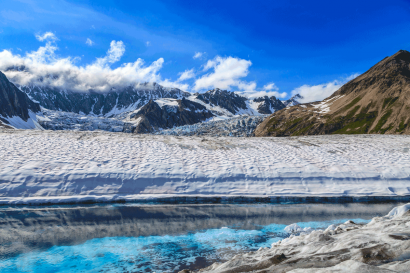 Fireweed cabin- two bedrooms each with a private bath, a shared living room with a stunning view of the lake and the nearby Tremble glacier. Each room has a queen sized bed but space enough to accommodate extra beds for a family of 4 or 5. Red Lake Trail cabin- accommodates seven people in three separate bedrooms, each with a queen bed, two with additional single beds (if requested). There is a private bath and a small sitting area in each room in this cabin. Iditarod cabin- We cut dead standing trees, peeled the logs, and built the cabin on site together when our daughters were young girls. Large picture windows look over the lake and the small deck is the place to be at sunrise. The cabin offers a queen bed and one twin in a loft area. This cabin offers a roomy private washroom. 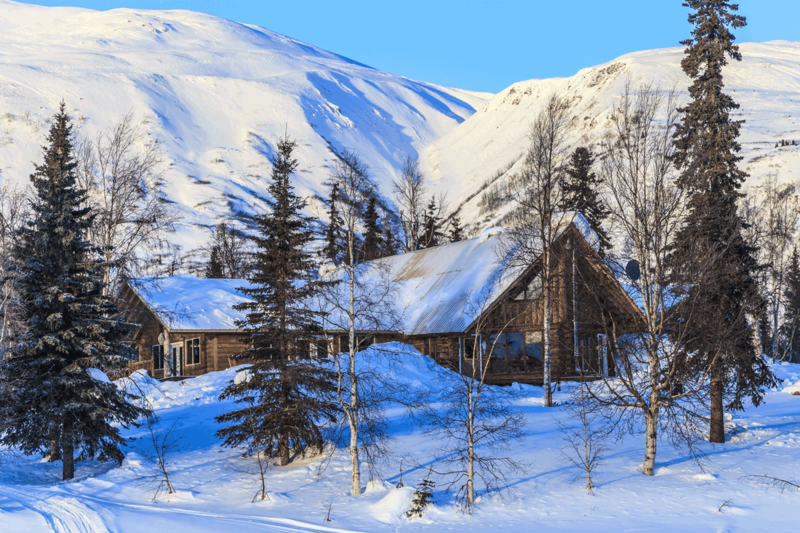 Mountain Pass cabin- This cabin is situated closest to the main lodge. It offers a log queen bed, roomy private bath, comfy open-style living room and a rocker on the deck. Happy River Cabin- This cabin offers a stunning lake view, artisan log bed and open-style living room area with roomy private bath. Birch cabin- Offers two (queen bed) bedrooms, two baths and a spacious living room.